This proposal was a combination of three volumes. Two cube volumes with one little hill. The east-west width of whole building is getting less from north to south to fit the context of the city, and the height of whole building is getting lower from south to north to fit the height of the old post office building. One cube is in north-south direction, another one is in east-west direction, each of them have a void box and a solid box. These two cubes are equally long and wide; they land on the little hill and sink into the little hill partly. All these cubes are covered by a façade with the same module, but with different material and effect. The ones covers most of solid box are perforated aluminum panels, but the ones near glass box are semi-translusent polycarbonate panels with lighting system hidden behind. In-between these two cubes, is the main entrance and a collective activity space where can be used together with podium. A path in-between these two volume is leading to that entrance. This path is also a main path for citizens to walk from Ratsgasse to the park, meanwhile for visitors from Antoinettenstrabe to get to Ratsgasse. Most importantly, we want to make this path not only a path connecting areas around city and not only a street in-between two volume, but also a path in the park and as a extension of nature. So, this path is designed with a natural topography climbing up and down as a part of nature within this park. At the north side of this path is a volume mainly for exhibition space and logistic space. The logistic space is directly connecting to Friedrichstrabe, but the logistic entrance is partially hidden in the little hill, so the cargos can get in there easily, meanwhile the process of loading cargos can not seem directly from the street. The east side of this volume is a glass box, this box is at the corner of Friedrichstrabe and Kavalierstrabe. It is designed to leave a view for the people at Kavalierstrabe can see the old post office. In the other hand, it offers a chance for all citizens can have a free glimpse of a small part of collections of Bauhaus. lastly, through this glass box, the tram can have more view when it turns. At the south side of this path is a volume mainly for office and entrance space, with a small part of exhibition space. The entrance hall is at the top of this little hill, where is directly connecting to podium, workshop, also the office spaces. When the main entrance is closed, the podium can still be used with its own entrance directly connect to an outdoor activity space. 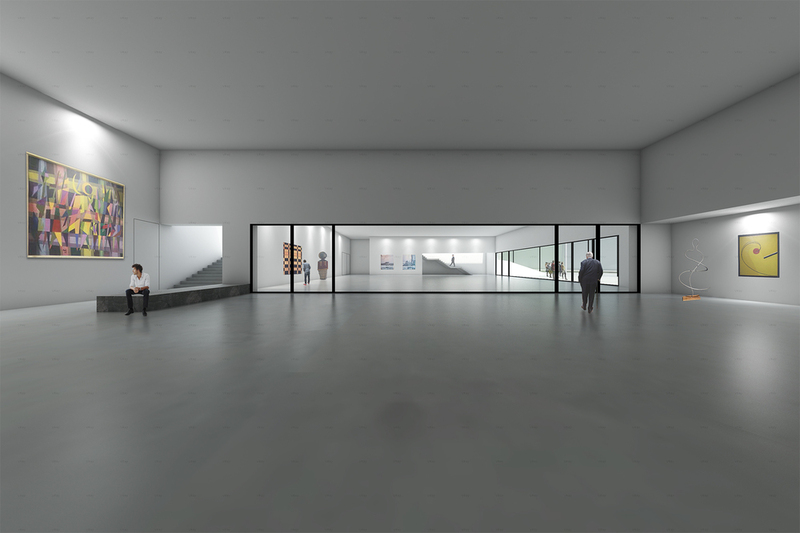 Through a elevator or a straight staircase at the entrance hall, people can reach ticketing hall where is connecting coffee area, museum store, exhibition space and activity space. The activity space is designed to be another glass box at the south end of this building, through this glass box, this glass box with auditorium inside is a background of Memorial for victims of fascism. The east side of glass box is designed as a huge glass door. It can slide into the wall near it, when it is open, the auditorium can directly connect to Memorial for victims of fascism. And this glass box can be used independently without relating to the museum usage. The main part covered by the little hill is exhibition space and coffee space. The temporary exhibition space extends from the south volume to the north volume and goes under the path in-between these two volumes. The coffee space is directly facing a open space at the feet of this little hill, and from the window of coffee space people can see the existing activity space in the park. To conclude, this building is designed to extend the spirit of Bauhaus through its gesture of dealing with nature and architecture, public and private, volumes and city context. This building is designed to host the past and to host the present, even the future, so it is meant to grow from the city and environment itself, to achieve an evolutionary space relationship, and a disciplinary urban order.